As with every procedure at Companion Animal Hospital, your pet's comfort and safety is our primary concern. Anesthesia and surgery can be the most stressful time for your pet; we do everything we can to minimize this stress and discomfort while employing the safest procedures possible. We understand that cost is definitely a factor in choosing your pet's health care. Our Care Team wants you understand the differences between our animal hospital standards and other providers who offer low-cost care. We now know that pets experience pain in much the way that humans experience pain. Proper pain control involves not only anesthesia, but a variety of additional medications given for the sole purpose of relieving operative pain. Companion Animal Hospital uses an average of three medications for pain alone for most procedures. In addition, our veterinarians send home pain medication for an average of 4 days after some surgeries. We use a heated circulating water pad to maintain the body temperature of your pet while under anesthesia. This allows us to keep our patient's temperature up during surgery, providing safer, smoother recoveries. Believe it or not, there are no regulations preventing veterinary hospitals from reusing needles and syringes. Companion Animal Hospital does not reuse syringes or needles on your pet. 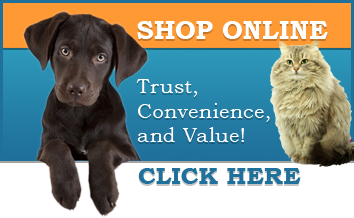 Companion Animal Hospital uses the strongest, best quality suture material available. We carry a varied supply of different materials in different sizes which are suitable for different procedures and different size pets. All older or compromised patients receiving general anesthesia have an IV Catheter placed prior to anesthesia. This allows us to administer medications more comfortably to your pet, and provides us access to a vein should an emergency arise during anesthesia. During anesthesia, your pet will receive IV fluids. These fluids are administered to help maintain blood pressure, provide internal organ support and to help keep your pet from being dehydrated. Our Veterinarians keep a supply of the most advanced emergency drugs available. In addition to external monitors, we have a surgical assistant dedicated exclusively to monitoring anesthesia. While under anesthesia, we use sophisticated monitors to measure tissue oxygen concentration, pulse rate, ECG, respiration and temperature. These have preset alarms to alert us the moment any minor problem arises. We use Isoflurane for most procedures; this is one of the newest generation anesthetic agents available. Our newer anesthetics are much safer and more effective than the older drugs. This means that your pet will have a secured airway with use of an endotracheal tube, another very important safety measure. Detailed discharge instructions are given at discharge and either the doctor, assistant or technician will review these with you. Most surgical patients are seen 7-10 days after discharge. This allows for an examination of the surgical site and a medical progress exam. Do not ever hesitate to ask a veterinary health care provider questions. You have the right and responsibility to your pet to know what you are paying for. Ask for a tour of their facility. Ask them if they use proper pain control, before, during and after surgery. Ask if they reuse syringes. Ask if they use proper surgery attire. Ask if they have a surgical assistant dedicated to monitoring their pet during surgery. Ask if your older pet will have an IV catheter. Ask if they will have pain medications sent home. All of these are expensive; some of the materials we use are 10 times more expensive than the cheaper ones. These things may or may not be important to some, but they are important to your pet and to our standard of care.